CONDOR Solutions carried out a new inspection of the fakel burner in the facility of Lunskoe OPF in October 2016. The facility is owned by Sakhalin Energy whose major shareholders are the companies Shell and Gazprom. The facility of OPF is in the Northeast coast of Sachalin island Russia. It is located 7km inland, at the place of influx of the gas-pipeline from the platform Lunskoe A. The entire facility spans more than 62,000 m². The primary function of OPF is aimed to processing of gas and oil from Lunskoe, as well as preparing them for transport by pipeline to the export crude oil terminal and production plant of compressed gas LNG – Prigorodnoe Complex. It also receives gas and crude oil from the platform Piltun-Astochskovo-A and the platform Piltun-Astochskovo-B, while preparing them for transport to the export terminal in the south of the island. There are pumps which allow processing up to 195,000 barrels a day. At full capacity, this facility can handle 51 million m³ of gas/ day and 9,500 m³ of condensate or crude oil / day. All technological systems at the OPF were commissioned in 2008. An important part of the facility is also a system of burners, e.g. the burners (Flare System) of low and high pressure. They were also subject to inspection carried out by the company CONDOR Solutions. The weather during inspection was cloudy, with the wind of 14 m/sec and the temperature of -10°C. The primary task was to conduct visual inspection using a UAV technology. However, in addition to the standard camera SONY Alpha 7R, we were also using a thermal camera from Workswell the Workswell WIRIS. The operational technologies are exposed to extreme weather conditions due to the geographical location. Mast of the burners are exposed to very low and freezing temperatures (-) and to extreme positive temperatures (+) caused by gas combustion. Therefore, it is important to check out the system of burners completely, using thermal imaging camera. Thermal imaging camera Workswell WIRIS allowed us to measure the temperature of the entire system of the burner. Doing the measurements, we have found that the burner system includes both low and very high temperatures. Therefore, we divided the measurements into two parts, as follows: The burner’s mast from the bottom part up to the top service runway and the upper part of the burner’s shank. 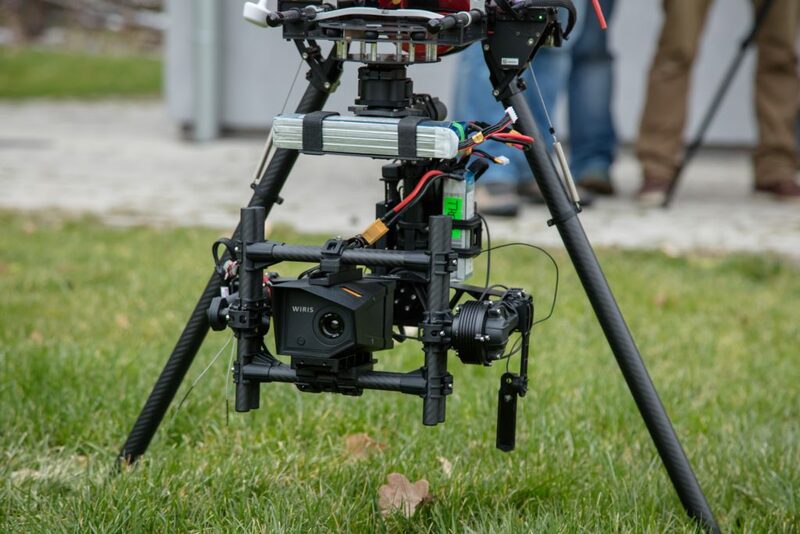 This thermal imaging camera offers possibility of measuring the temperatures up to 1,500°C (using a high temperature filter) this is one of the only high temperature thermal camera systems available for the drones. In the first part, we found out the temperature of the mast and the rising pipeline of the system of high and low pressure; we also prepared the temperature profile, as shown in the figure. The graph and thermogram clearly show where the pipeline isolation finishes. At this point, the temperature sharply increases up; and consequently, the temperature gradually decreases together with the height, up to the upper part – the shank; then the temperature rapidly increases up again. Up to the temperature of about 2,000°C. 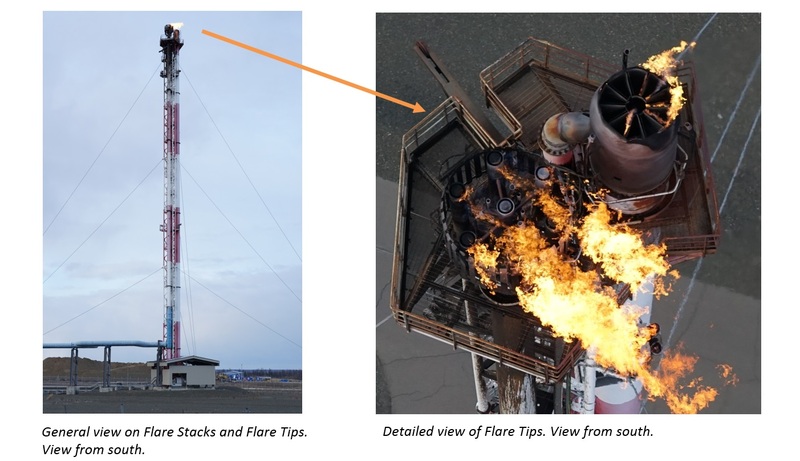 Based on information obtained by the thermal imaging camera of Workswell WIRIS and the unmanned aerial vehicle, the company CONDOR Solutions compiled the final report which described in detail the condition of the burner system of high and low pressure. The operator, Sakhalin Energy, has got the thermal imaging data. This means that it is possible to schedule maintenance works so that restriction of the production process in the facility is minimized as much as possible.